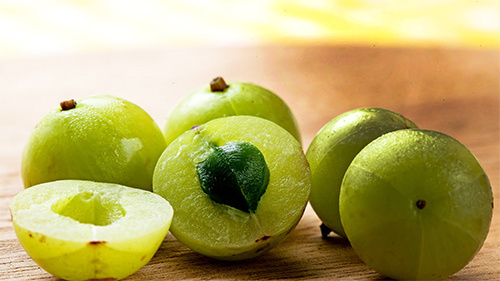 The Indian Gooseberry (Phyllanthus emblica fruit) also known as Amla in Sanskrit, is commonly found in the forests of India and hence, the name. The amla tree is small to medium in size and reaches maximum 18m in height and is usually deciduous. The leaves are simple, and closely set along the branches resembling pinnate leaves. The Indian gooseberries are of two types – the ones grown in forests and the ones that grow in villages in India. The fruits in forests are generally smaller and thicker, while those grown in villages are bigger and softer. It is said that the gooseberry found in villages in India, have more medicinal value than those found in forests. According to Acharya Charaka, the Father of Medicine, the Indian gooseberry or Amla lends longevity and promotes youthfulness, and hence, is considered the best of all fruits. In Ayurveda, the Indian gooseberry or Amla is considered to be equivalent to ‘Amrit’ (a liquid portion which on consumption will lead to immortality). Let us take a look at why Amla is truly referred to as Amrit. Amla is an excellent eye-coolant, helps in removing dark circles under the eyes and also prevents boils in the eye. Mix 20g to 50g powdered amla in half-a-litre water, filter, and the resulting solution can be used as eye drops. Amla is an excellent tonic for the hair. Amla can be used in the form of paste or shampoo for strong hair growth and for preventing grey hair. Mix equal proportions of powdered amla, carom seeds and turmeric and consume 1 to 2gms of this paste by mixing it with honey…it helps clear any sore throat or hoarse voice. Extract juice of 10 to 20gms of amla, and mix with 2 to 3 gms of honey. Consuming this will help in removing any breathing difficulties. Consuming 10 to 20gms of amla juice will help in calming nausea. Continuing this twice or thrice a day will put a complete stop to nausea or vomiting sensations. Mix amla and honey and consume regularly for long-term relief from pitta dosha. As a simple remedy to clear urine retention, soak dried Indian gooseberry in water and boil well. Drinking this solution twice a day, clears urine retention. Mix together Indian gooseberry and honey and consume in a semi-liquid form twice a day for a healthy liver and when treating for Jaundice. Mix together 10 to 20gms of amla juice with 2gms of turmeric and 10gms of honey. Consuming this twice a day (morning and evening) can offer effective relief from urinary tract infections. About 3 to 6gms of powdered amla can be mixed with water and consumed for effective relief from headache, constipation, and piles. Boil amla and make it into a semi-liquid form. Dry roast pepper, dry ginger, black salt, cumin seeds and powder them. This can be mixed into the amla extract and consumed by adding a pinch of asafoetida powder. Mix 5 to 6gms of amla with a teaspoon of ginger juice and add this to a glass of water and consume for relief from diarrhoea. In case of any wound, massage the place with amla juice, and this gives immediate relief. Dissolve 3 to 6gm of powdered amla into amla juice, and add a teaspoon of ghee, two teaspoons of honey and mix well. This mixture can be consumed on daily basis, followed by a glass of milk.